What is It with EP’s these days? A lot of bands start life with an Ep or maybe two .After that, they start making full albums and never look back. And yet somehow nowadays bands return to producing EP’s after a couple of full albums. Why would that be? Can’t be for commercial purposes, because apart from Metallica, Iron Maiden and Rammstein there are only a few bands that are able to make a living off their music. To please the fans while working on the next full album? That’s more plausible. In fact, that’s probably the reason for this little in between from Spanish folk / battle metallers Incursed. Should everybody purchase this EP straight away? Ehm, no. Is it a bit of fun? Yes, that’s exactly what this is. Five songs, starting off with title track The Slavic Covenant. An entirely convincing piece of folk metal. Melodic as hell, nice grunts, plenty of craftmanship from every band member. You can’t help thinking of Twilight Tavern by one of the biggest bands in the scene, Ensiferum. Very nice effort, indeed. Give us more of that. Sadly, after this song things go slightly downhill. ‘Akelarre’ is okay, but the chorus is just so lame. It’s like the clean singing, not unlike power metal band Thy Majesty, is trying to sing you to sleep. On to third song ‘Wild’. Nice song, except this is the third time the band releases it. Once on the first demo, then on their debut album and now on this EP yet again. And it’s not like the Keelhauled for Alestorm, the song you want to hear all the time. So, not sure about the choices the band made while contemplating this EP. Swiftly moving on to ‘Fear A’ Bhata’. 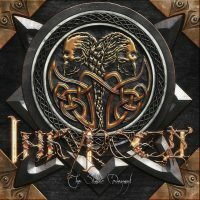 Nice enough folk metal song, containing some close harmony singing. A bit of violin (keyboard) gives it a nice feel. And finally a folk metal cover of ‘Take on me’ from Norwegian Aha. Truth be told, whether to like a pop song cover depends on the phase the band is in. Think of Trollfest. In the beginning part of the fun was their Britney Spears covers. And then there comes a time that you want to be taken seriously on your own. And that’s why I think Incursed should only release their own songs. Play it live to get the crowd going, surely. But otherwise, show the world what you are capable of yourself.